Every day that we wake up and open our eyes to focus on what’s going on around us, we always expect our vision to be the same that it has been each and every day before. But what happens if suddenly you’re experiencing blurry vision and after a few days, it hasn’t gone away? Although we’re going to share with you several causes that can lead to having blurred vision, one of the most common ones is actually because our eyes are simply tired. When we’ve been sitting in front of a computer monitor for hours on end, sometimes we don’t realize how much we are straining to see. That’s why it’s so important to eat a diet that is loaded with leafy greens, salmon and citrus fruit; that we work in well-lit rooms and that we take breaks from our computer screens throughout our work day. That said, there are other reasons why blurry vision may occur. 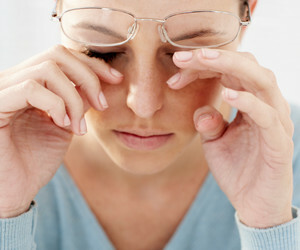 Some of them include eye conditions like cataracts and glaucoma, migraines, nearsightedness, certain types of medication and Presbyopia which is a disorder that consists of not being able to focus clearly. It’s also important to remember that if you wear glasses or contacts that you should clean them regularly being that dirty lenses can also lead to blurry vision. And still, one more cause of not being able to see as clearly as you would like is dry eyes. All About Vision is one website that can walk you through what you should do if dry eyes are the cause of your blurry vision. Just go to the site and put “dry eyes” in the search field. So, aside from not seeing clearly, what are some of the other symptoms that are directly associated with blurred vision? Some of the include having eye pain, noticing that there is discharge that is coming from one or both of your eyes, itchy eyes, an increase in the amount of tears that you produce, extreme sensitivity to light, loss of central vision or even bleeding from one or both eyes. If you happen to have any of these symptoms, it’s imperative that you see an eye doctor; one who works at an office such as Lone Star Eye (in Austin, TX) so that you can have a professional eye exam done. After testing your eyes and reviewing your symptoms, your doctor will then be able to provide for you a remedy that could range from taking a prescription to getting a (new) set of glasses to even eye surgery. Remember that even if you don’t have blurry vision, it is still important that you have your eyes checked on an annual basis. For information on how to find a reputable eye doctor within your area, visit Eye Doctor Guide and put “how to choose a good eye doctor” in the search field.